Thanks to a grant from the CoServ Foundation the Nighthawk Composite Squadron has upgraded it’s CAP Mission Operations Center, (CMOC) located at the Denton Enterprise Airport. Through the grant the Squadron was able to obtain all new computers, workstation tables, chairs, and other related equipment. By using casting technology any computer in the Operations Center can display information on one of the three main wall monitors. 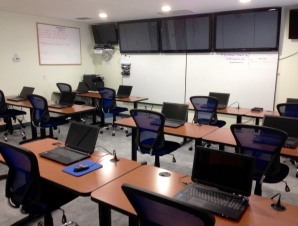 The CMOC is used by CAP to manage search and rescue missions and other CAP events as well as a computer classroom and a training center for the CyberPatriot program.